Project Author: Lara Tupper: "It started on a cruise ship, where nothing was exactly real." Lara Tupper: "It started on a cruise ship, where nothing was exactly real." 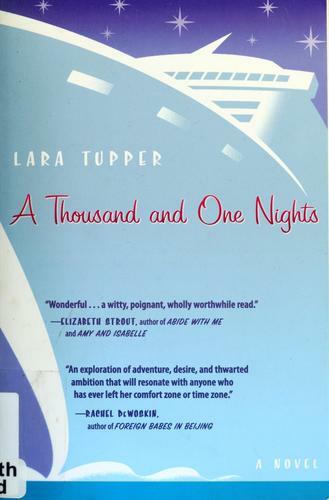 A Thousand and One Nights (Amazon) by Lara Tucker is a book I read a few years ago, way before I began this project. However, I didn't finish the book I was going to review today, and so I decided to write about this instead. A Thousand and One Nights is the story of a woman named Kate who dreamed of being a professional entertainer. So when she gets hired aboard the MS Sound of Music, it seems like her dreams are coming true. Before long, she meets Jack, a charming British man. They sing together and eventually fall in love. Then four years pass and all of a sudden Kate is a lounge singer, traveling the world with Jack. Unfortunately, this is nowhere near the life Kate wanted-it turns out being a lounge singer isn't as glamorous as it looks. Eventually Kate has to decide: Will she keep this life or find another? This book is definitely a guilty pleasure sort of novel, no question about it. I would say it's the perfect beach read. However, it definitely goes deeper than the average guilty pleasure novel-Kate deals with some very real issues, and not all of them are about getting a guy to notice her or anything like that. Pick up this book if you're looking for something substantial but not too heavy. I read A Thousand and One Nights some time ago, and I just decided to write to you to tell you how much I enjoyed it. You combine the elements of a guilty pleasure novel with the journey of a young woman growing up very well. I hope to read more from you! Maybe tomorrow I'll have School For Brides done! Who knows?! Pamela Klaffke: "They think they invented irony."